They say it's what separates us from the animals. We all do it but few of us can explain what it actually is. It's something commonplace, yet at the same time profoundly mysterious. Some people even ask 'what use is it?' but science tells us that laughter actually does bring physical and psychological benefits to humans. It's supposed to make us happy, feel good and bond relationships. And making someone laugh can help get them through difficult situations. So what makes you laugh? I've been severely scolded because of my weird sense of humour. I admit it. If you fall down the stairs, bump into a shop door, get stuck in the train doors - I'm the one who's laughing uncontrollably in the corner until I can regain my composure to help, and I don't even know why. I just find things like that funny - when it's happening to someone else! My practical jokes are worse, and they've back-fired a few times, so I'm very careful what I do now. People say I have a contagious laugh. Once I start, bit by bit everyone around me will join in and they don't even have a clue why I'm laughing! Some people have a nervous laugh. If you catch them out in conversation or something doesn't seem quite what it is, they laugh it off in an unconvincing way. I've even seen people laugh and cry at the same time when faced with terrible adversity. Perhaps it's a coping strategy. So look at how complex and mysterious laughter is. It can be hysterical, evil, laughing insultingly in someone's face or a joyous expression of laughing together. So the next time you're laughing, ask yourself, why am I laughing, what kind of laughter is it, and what is laughter anyway? Have you ever played a joke on someone and it back-fired? Where do your draw the line between what's funny and what is 'sick' humour? It is difficult to explain. I think it must have different reasons depending on the situation. I can only guess. With slapstick comedy I know it's not real but it still makes me laugh. But even if it was real I would have to stop myself from laughing then see how I could help. Maybe it's a feeling of relief that it did not happen to me. A joke has a surprise punchline. Maybe it's the surprise. I do laugh with someone who has a contagious laugh even though I don't know why. In some situations I have to stop myself from saying something funny because it would offend someone. I'm not sure if this counts as a joke backfiring but in grade school a boy put a tack on the chair of one of the girls. When she jumped into the air screaming I laughed along with the others. I was standing not too far away from the girl when this happened. The nun asked me if I had a laugh in this. She meant if I put the tack on the chair. I thought she meant if I was laughing so I told her yes. She slapped me. I asked myself what just happened? John, I'm not good at getting someone's joke unless it's blatantly obvious but I do enjoy a bit of slapstick. Your theories on what makes us laugh are interesting. Certainly it is more than one thing and 'contagion' and the unexpected often play a big part in this. I also laugh at ridiculous situations and can't help myself to stop laughing. I laugh watching silly comedies, I laugh at good and kind jokes. When I call my girl friend I usually don't intent to laugh, I am calling to share and vent but we always end up with laugh. We like to make fun of ourselves and not to take ourselves seriously. Once I told that I have to learn to laugh while I am driving in my car. It's kind of therapy. That was a weird advice buy I tried to do it anyway. And it didn't work. There wasn't a situation which made you laugh. You have to feel this line between what is funny and what is sick humor. Sick humor's purpose to humiliate, it doesn't have kindness, it's never forgiving. Funny is kind and forgiving. Wish you a nice weekend and relaxing! It's good when you can have a laugh at your own expense. It helps to relieve tension and stress when you just fling everything up in the air at the end of a bad day and burst out laughing. Sometimes stress makes you laugh when you should not. We were once driving a van and were hit by a sports car. The front of the car just went under the van. No one was hurt, the van was fine but the front of the sports car was crushed. Out of it came a guy who, oblivious of his girlfriend riding with him, started caressing his car and crying and bawling. Waiting for the police, we had to walk some distance away from the scene because we could not stop laughing. We realized it was not appropriate at all, but because of stress no doubt, try as we may we could not stop. I'm glad I'm not the only one who had the same response as you. Just the image of this grown up man stroking the car with his girlfriend sitting there unattended would be more than enough to set me off for weeks, ha ha ha ha. I wonder how their relationship ended? I just showed this to someone else and they burst out laughing too!!! I don't find jokes particularly funny because they are "formula humor" and evewn people without a sense of humor know when to laugh. I crack up when comedians make me look at myself and my world in an offbeat way. So you like those comedians who are quirky and on the edge? One thing I didn't touch on in this post, but opens up a whole other area, is how many of our comedy greats were depressive personalities who struggled with their demons when out of the limelight. I wonder if this could be something to do with them being able to see the world in that different way. What makes me laugh is what is unexpectedly funny- things I can't predict at all. I don't really find stuff funny anymore that I can see coming a mile away. This sometimes makes it seem like I have a weird sense of humor, but that is how I am. I like that unpredictability too Shelly, the fact it was so unexpected and out of the blue makes it even funnier to me. What's wrong with having a weird sense of humour anyway? Especially since laughter is in and of itself so weird in the first place. My late Mother used to laugh at the most awkward moments. About a year before she passed away, I asked her why she did this and her reply surprised me. She confided that she laughed to cover her feeling nervous. My middle sister thought she was doing it to irk her. Otherwise, we all had so many belly laughs that we shared. I, too, love slap-stick comedy. Facial expressions get replayed on our telly all the time and we'll laugh until our sides ache. In church I used to get those silent uncontrollable fits of laughter. Those are contagious. I've been giving a lot of thought lately to trying to decide what exactly I think is funny and why I seem to have such a different sense of humor from so many people. I read a LOT of blogs and I have to admit that doing so brings to light how very different people are in terms of what we think is funny. Poop? The word might be funny but endless stories about it, not so much for me. Yes, I see what you mean. Some words are overrated unless you can come at a very different angle to make it funny. I think this is also a reflection of how humour changes with age. To little children a 'rude' word or fart can be funny simply because it is rude. As we get older, our humour develops with us... at least in the majority of cases... Thanks mate. I think you and I are cut from the same cloth, RPD. I laugh at mishaps, too. If the hubs stubs his toe and howls, I cannot stop laughing. He always asks, "Why do you think it's so funny when I get hurt?" I feel kinda bad about that but I can't help it--it just make me crack up! I also love quick-witted humor like Robin Williams uses. My husband thinks very much like that and is often the inspiration behind my blogs. Some of the WEIRDEST lines you've ever read on my site undoubtedly came from him! The same cloth for sure MM, that's why I'm always on your blog. And I've always said you've got a real crazy family too with lots of laughter going on. After looking at some of the pictures you shared of your husband on your blog, it's clear why he gives you inspiration, ha ha ha. I tend to just laugh at life, but I only truly laugh when I'm comfortable. I went through a good portion of my life, fake laughing. It can be very frustrating when you spend time laughing for someone else/other people. Inside you're not really happy at all, it's just putting on a show for the outsiders. Yet another aspect of laughter - using it as a tool to fit in and become accepted in a group. Long time ago, my friend fell down the stairs at Burger King, but she was laughing all the way down. When I opened the door I found her sitting on the floor laughing at herself, so that made me laugh. She was okay. It was kind of funny, and her shoes flew off too. Now that's what I call a good laugh Susana, ha ha ha. I'm sure you've re-lived that scene in your head for years. Lanthie, I'd love to have a good belly laugh at least once a day but it doesn't happen. We should make it our business to find more laughter in life especially during some of those dull cold wintry days ahead. I laugh at myself. I find irony and laughter at every corner. That's who I am. Perhaps it is a survival strategy. Yes, I do laugh a lot and whenever I talk with a good friend we both find the funny side of everything, even when we feel down. Jersey wrote a post about laughter too and I mentioned that this week I had a funny poem accepted by a literary magazine. This one combines humor and irony. (It will be published in December). Humour and survival. I think that is very much where irony comes in, as it enables us to convert the bitter into bitter-sweet. As though being able to laugh at something somehow lessens the element of fear and intimidation, enabling us to face it better. I've read JerseyLil's post and as usual it was brilliant. I loved all the funny quotes and pictures she used. Julia, please feel free to leave a link to your poem here either now or when it is published in December (on this post or a later post). We'd all love to have a read. 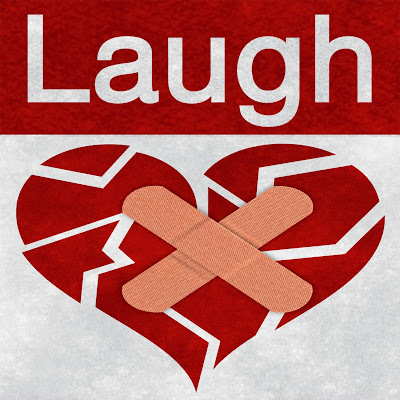 I think laughter can be a coping mechanism, and I have a story that I find rather embarrassing: when my first child was a newborn, we were at the pediatricians for her first round of shots. I was unbelievably in love with and bonded to her and hated the fact that she would be in pain. When they stuck the needle in and she started to scream, I started to laugh. I was mortified that I was laughing, but I couldn't stop. I'm thinking it was an involuntary strategy to cope with the stress. Or I'm just a freak. RPD... What a great subject. #2... No. Tough question, but no. #3... Not a fan of Sick Humor & just don't go there. I'm all about the Smile, having fun with a good laugh, etc. They say it takes less muscles in your jaw area to Smile than it does to Frown. There ya go. Smile. The sun comes shining through' blah blah blah. But there's research that also shows that our faces are more attractive and we appear more trustworthy to others when we smile. There are so many benefits when you stop to think about it. Thanks man. I figured you had a weird sense of humor like me. : ) I love to laugh and the most bizarre stuff can set me off. When I'm driving if I see a sign that says, "Warning Bridge Work Ahead," I imagine a giant set of teeth being worked on by a dentist. Then I can't contain myself. Oh yes, your humour is right up my street. Quirky. I'm sure that if you heard it, you'd be laughing all the way home, ha ha ha ha!!! Rum-Punch Drunk, it seems we are on the same wavelength since I just posted about humor too! It’s fantastic that you have a “contagious laugh,” I really like that. What makes me laugh? So many things, I’ve been told I’m easily amused! I laugh at things like my dog chasing her tail, squirrels running around the yard frantically burying and unburying their nuts, silly jokes, comedies (Monty Python is still hilarious to me), unexpected things that just amuse me like yesterday when the popcorn popped right out of the pan and all over the kitchen, that just struck me as funny! I’ve never played a joke on someone that backfired because I never play practical jokes. About what’s funny and what’s sick humor, I draw the line at anything that diminishes another person, anything that is disrespectful to their life choices, class or ethnicity, and anything that makes fun of someone’s physical or mental disability. In general, though, I just like to smile, I like to laugh, and I often laugh at myself. Great post! I know, great minds think alike JerseyLil :) and your post really did give me a laugh. My favourite was the dog with the water melon on it's head. I totally agree how you draw the line too, because anyone who has to put down the next person in order to make a joke, really isn't funny at all. Now, if I came out the shower and saw someone with a mask, I would freak out and most probably attack, ha ha ha ha. I did a similar stunt on a loved-one. Unfortunately they were holding a glass of red mine and the carpet they were standing on was mine. Needless to say I didn't do much laughing for the rest of that evening! Yes, I've seen people (and myself as well) laugh and cry at the same time. And like you shared, I think it's a natural coping mechanism. Laughter (humor) can be a healing salve that comes in that right moment to help us cope. I'm a HUGE laugher. And so many things make me laugh. But I think I laugh at myself the most, during times when I might be taking myself too seriously; finding the humor in it. Perhaps it's going a bit far but what if some of those control freaks, bullies and dictators could only laugh at themselves instead of taking things so deadly serious. Wouldn't the world be a better place? Many times laughter brings a sense of perspective or perhaps you need a sense of perspective to laugh in the first place. A good ole laugh is definitely good medicine. Laugh and the world laughs with you they say. Cry... and you cry alone. So true. Thanks Suzanne. Yours is a gift that you need to share. People like you are the salt of the earth. To make up for all the old sourcrouts out there that can only see the glass as half empty. Keep the humour coming, I say. And can I also add how sorry I am to see the events that have unfolded recently in your country. My prayers are with everyone over there. Aha and aha ha. Laugh in the face of adversity. Heck, if I didn't laugh at the ironies of life, I don't how I'd survive. Oh how I laughed the day the ambulance driver wiped out my car. Okay, not quite. However, in the back of the ambulance as they checked me out, how convenient, the lady attendant asked for my name. Even during such a surreal situation, I said, "Okay, now you name's Gary." I've no doubt your laughter and your humour is infectious in the nicest possible way. If you're somewhat like me, heaven forbid, wherever you go, folks faces start to beam in anticipation of your next zany remark. Happens to me a lot. The ability to laugh in the face of real catastrophe and personal disaster is a true measure of character Gary. At least you got immediate medical attention! May you make the Dead Parrot, Ministry of Silly Walks and Dirty Fork seem like Shakespeare. Get Penny to take a look at your head :) Thanks mate. the important point is laugh, despite all the troubles of this world ! Laugh is the healthiest thing to do for life. I could laugh hysterically sometime. I often laugh at some moments I think were ridiculous. I also appreciate good sense of humor expressed by verbal languages than by body language. But anyway, I think people should laugh out loud at least once a day, no matter by what reasons! Thanks Yun Yi. I'll do my best to try and see the funny side of life each day. Do you know there is a sect in India where they force themselves to laugh for half an hour each day? Perhaps that's taking it a bit too far. I think laughing, like crying, is a natural reaction to life's miseries and absurdities. I've noticed that those who can neither laugh nor cry at the bad things that happen to them are the ones most likely to fall into a deep depression. Is this an introduction into Filipino humour? I get the feeling this is going right over my head. Thanks for stopping by and hope to hear from you again. I try to find the humor in most things. I think that it really does help get us through tough times. I also would love to hear your contagious laugh Rum-Punch Drunk! Who knows, Empty Nest Insider. Perhaps one day we'll have a blogger's convention and all get to meet up in the flesh. I'm sure then we would all end laughing, and perhaps even crying together. I laugh when I am happy...I even laugh when I am sad...I laugh because if I don't, the pain would be unbearable. Laughing, in my opinion, is one way to put up a brave face, yes, even in the midst of troubles. I'm struck by the amount of readers that are laughing their way through pain. It just goes to show how much is going on behind those smiling faces we see every day. Thanks Napoleon. I don't laugh as easily as I would like to, but when I do..it's over something weird or inappropriate. It's funny but through this discussion I've realised something. We don't chose our taste in humour, we're born with it, just like our taste in food or clothes. Welcome to Rum Punch Drunk and I hope you return to read some more. I smile and chuckle a lot, but once in a while I get a really good belly laugh! I love those. I love hearing people with big laughs. Your laugh will probably make me laugh. I am a telephone prankster... especially back in college. My roommates and I would laugh for hours playing jokes on others. Weird enough, I don't find sick humor funny, but I find non funny jokes really funny. I agree. Laughter is really great medicine...happy or say...it improves our countenance. Oh, telephone pranks are big here in London, especially amongst the youngsters. It happened to me once and I was so mad when I found out it was a hoax. I bet there is an army of people out there holding a grudge against you. If I were you, I'd be scared to pick up the phone. Be afraid - be very afraid. Omgosh, you and I should never, ever be in the same place at the same time because the people around us would think we're blithering idiots! I laugh at people and their unfortunate accidents ALL THE TIME! - As long as no one got hurt and as long as I'm not involved.. - I can find something funny in just about every situation and I am constantly being told, "That's horrible.." Followed by their own laughter.. I think people like you and I are here to point out the humor and make it! I too am a prankster of the worst possible kind and I always laugh until I nearly pee myself and often times the people I prank are not nearly as amused as I am but whatever, get a sense of humor people! I agree. Laughter IS the bed medicine! When I had cancer and they thought they were going to have to amputate my left leg I said, "That's fine. I'll change my name to Ilene and get a job at IHOP (International House Of Pancakes.) :D - Great post! That's the thing Magical Mystical Mimi, you're able to laugh not only at the mishaps at others but also in the face of a personal catastrophe such as being diagnosed with cancer. I can just imagine the look on the doctors faces when you said about changing your name to llene etc. They must have thought you had lost the plot, so to speak. You and I together? We will no doubt end up spending the night at the local police station - for our own safety of course, ha ha ha. Yes, that happens sometimes. I always say to people to first write their comments on 'textedit' or 'word' then copy and paste it into the comments. That way, if you lose it the first time, you can easily just copy and paste it back in again. Awesome post RPD to make people realize- laughing is the best medicine than anything else. I love to smile, laugh n giggle most of the times. Definitely something funny (may be awkward for others at times) cracks me up all the time; but I also love to find reasons to smile or laugh while with family or outside, with friends or in a crowd. How are you?? Nice post again. I have laughed even when my teacher was scolding me. I kept laughing like a stubborn kid... and it was not when I was a kid, it's few months back when I was in college. Sometimes I laugh at myself remembering my something funny I did. But I feel your smile or laughter should be a medicine for you and others too. It should not turn out to be hurting for someone. It's great to hear from you again Esabella. Hope you are keeping well and I enjoyed your recent poem on your blog. I do the same thing. I remember something from my past and begin to laugh out loud unexpectedly. You always have a good feeling when you've had a grand laugh. Thanks Esabella. Hi RPD, I love, love, love to laugh,lol. Sometimes I can literally feel those feel good endorphin's move around. The funny thing is, sometimes I can have a real sick sense of humor and than other times not have one at all. But, one thing that really gets me going are those Americas Funniest Home video's, they crack me up. Over here we've got a program by the BBC. It's got your Mr T on it and it's called 'World's Craziest Fools'. For some reason they seem to always have the BEST mishap clips from around the world and it guarantees me a good laugh at least every 5 minutes. Nice to hear from you again My Meddling MInd. Go on Jamie, spill the beans... what was your little bro laughing at? I'd really like to know! Laughing at a funeral? I went to a funeral of a friend once. He committed suicide and the first part was really, really sombre. Afterwards all his friends sat round and began sharing stories and memories. Before long everyone was laughing. I think both those sides of the event honoured him, and it wouldn't have been the same if the day had only been about crying. So, I'm a healer if I make you laugh. Cool. I think I made you laugh. Maybe a little chuckle or a snort? Tell the truth, you read something I wrote and at one point you sprayed your keyboard with coffee through your nose. Yup, I knew it. Thanks. I think anyone who can make another laugh is a good thing. If they can make someone laugh when they're hurting they certainly are a healer. I've sprayed this keyboard enough times, ha ha ha ha. Love to hear from you again Timothy. Laughter definitley is the best medicine! If you listen long enough to other people laughing it is bound to be contageous! Hayley, welcome to RPD! Good to hear from you. Yes, laughter does seem to be contagious somehow. I've witnessed it myself over and over again. But I'm not sure what causes this effect. Hmmm... I wonder if you have any ideas? Hope you come back to interact some more with us. I guess different people laugh for different reasons. But I think most people like a good laugh. I often use humor, within limits, in my sermons. They seem to go over well most of the time. It's as if people are setting on ready to hear something for a good laugh. Outside of preaching, I tend to always try to say things that are humorous or funny among friends and family members. People and how they are wired with respect to laughter is quite a mystery but since"a merry heart does like medicine" (Proverbs 17:22), laughter is generally a good thing. In my experience any kind of public speaking is enhanced by humour. Keeping people's attention over a period of time is a real challenge and the odd laugh gives people a chance to relax before resuming their concentration. Also, I never knew that the saying about laughter had it's roots in the Bible! So I've got backing from this post in the Word ha ha ha. Thanks Frank. I think I have quite a dry sense of humour. I don't really go for slapstick comedy unless it is Norman Wisdom and his mannerisms and facial expresssions get me laughing. I also laugh at the film 'The Life of Brian'. I wonder if people laughed much century's ago? I'm sure people have always laughed and always will. It's just something about being human. If a person goes too long without laughing, I believe it's a sure warning sign that something is profoundly amiss and they need help. Thanks for your comment Simone. We used to hear laughter is the best medicine. May it is, in certain situations. Usually, there's a feel-good feeling after a laughter.